The Department of Justice (DOJ) has dismissed complaints against several high-profile drug trade suspects including Cebu businessman Peter Lim, President Duterte’s kumpadre (wedding cosponsor), because of weak evidence. Lim, self-confessed drug distributor Kerwin Espinosa, Peter Co and other respondents were exonerated by the DOJ in a drug trafficking case filed by the Criminal Investigation and Detection Group-Major Crimes Investigation Unit (CIDG-MCIU) last year, based on a resolution released on Monday. All three men have been tagged by the CIDG as drug suppliers in Bohol, the rest of Central Visayas and Eastern Visayas. 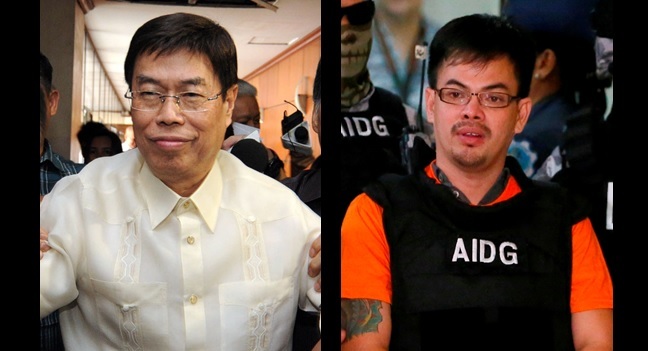 The three had allegedly conducted discreet large-scale drug deals at a mall in Makati City, paving way for the shipment of around 100 kilos of shabu to Central and Eastern Visayas including the province of Bohol from 2013 to 2015. In its complaint filed before the DOJ in August, the CIDG indicated that alleged Visayas drug kingpin Espinosa was supplied “staggering amounts” of drugs by Lim. “Indeed, there was widespread illegal drug trade in Regions 7 and 8 during the years of their existing conspiracy,” the CIDG said. The CIDG’s allegations were based on statements made by Marcelo Adorco who was allegedly part of Espinosa’s drug ring. Adorco was caught in a drug buy-bust operation on July 8, 2016 in Albuera, Leyte, Espinosa’s hometown. In his sworn statement, Adorco noted that both Lim and Co each supplied Espinosa’s group with 20 kilos of shabu in February of 2013 during two deals both made at Cash and Carry in Makati City. “Both amounts of shabu were intended for transportation, selling, distribution and trading in the area controlled by their group (Espinosa Group) in Regions 7 and 8 (Bohol, Samar Northern and Southern Leyte, Biliran, and some parts of Cebu),” said the CIDG based on Adorco’s statements. According to Adorco, four more drug transactions took place between Espinosa’s group and Lim also in Cash and Carry in 2014. On June 4, 2015, Lim and Espinosa allegedly met in Thailand to thresh out another drug transaction which was then carried out again at the parking lot of Cash and Carry on June 7, 2015. That time, Lim supplied Espinosa’s group with 50 kilos of shabu as per their deal in Thailand. The drug supply was also meant for distribution in Central and Eastern Visayas, said Adorco. In the same complaint, the CIDG listed names of suspects allegedly involved in the largescale drug operations and their provinces of origin. All of the other respondents including Lovely Impal, Marcelo Adorco, Max Miro, Ruel Malindangan, Jun Pepito and other personalities known only by their aliases, were also cleared of drug charges. “We are mindful of the zealous intention of the complainant to eliminate the illegal drug menace prevalent in our country today, and it is public knowledge that this fight has taken numerous lives,” a DOJ panel said in a ruling dated Dec. 20 last year, but not made public immediately. The CIDG has not indicated whether or not the said respondent was Rowen “Yawa” Secretaria, an alleged drug lord based in Bohol. However, Secretaria was already killed even before the complaint was filed. He was gunned down during a police anti-drug operation at his hideout in Banacon Island, Getafe in 2016.